I don't really know what's going on with me and my recent infatuation with fish, but it must have something to do with my daughter watching Finding Nemo every stinking day. At any rate, the thought somehow came to me, "Wouldn't it be cool if fish could fly?" And then I thought of all of the necessary equipment a fish would need. 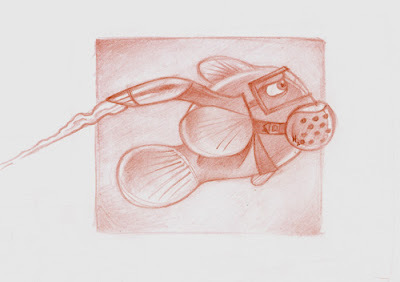 A fish would obviously need an oxygen tank, and he'd need some sort of propeller, but other than that, he'd probably be okay, because he has all the right equipment (i.e. fins) to steer himself. Which leads me to ask why fish haven't thought of this before. It's so stinking easy!